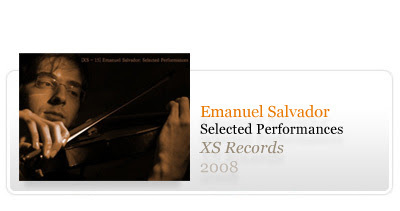 We’re glad to annouce this new release by one of the most promising portuguese young generation of violinists Emanuel Salvador. Born in 1981, Emanuel Salvador has already performed as a soloist and chamber musician in many important venues including St. Martin-in-the-Fields and Southwark Cathedral (London), Philharmonic Hall (Uralsk - Kazakhstan), Gulbenkian Museum, Rivoli Theatre and Bank of Portugal Hall (Lisbon), Príncipe Filipe Hall (Oviedo, Spain), Centro de las Artes Escénicas y de la Música (Salamanca, Spain), Sto. António Church (Rome) and Manoel Theatre (Malta). He has been awarded several prizes such as: first prize at Isolde Menges (RCM) and Beckenham Festival competitions; Barbirolli Memorial and Wolfson Foundation Award; second prize at Jovens Músicos competition; Honours Mention at Júlio Cardona International Competition - Portugal; Gulbenkian Foundation Scholarship (2000-2003), amongst others. In 1999 Emanuel graduated from Artave (a specialist music school) as the best student of the year. During this time he studied with Costa Santos, Sergei Aroutiounian and Yakow Marr. He then moved to London, where he got a Bachelor of Music Degree from the Guildhall School of Music and Drama (studying with Professor John Glickman) and a Master’s Degree in Advanced Performance at the Royal College of Music, where he studied with Dr. Felix Andrievsky. Other professors with whom Emanuel studied include Ulf Hoelscher, Alberto Lysy, Vadim Brodsky, David Takeno, Gerardo Ribeiro and Ilya Grubert. As a concerto soloist Emanuel has played with Artave, do Norte, Nonesuch, Morley College, Vitalis, Newbury Symphony and Nova Amadeus orchestras, under António Soares, Ferreira Lobo, Vítor Matos, Chris Dawe, David Drummond and Massimo Scapin. His festival appearances include Encontros da Primavera e O violino por… (Portugal), Proms in St. Judes and Ampthill (U.K.) and at the International String Orchestra Festival (Malta). Some of his performances have been recorded for the Portuguese Radio and Khabar TV (Kazakhstan). The Violin Concerto by Joaquim dos Santos, was written for, and premiered by Emanuel in Rome in June 2005 and later in Portugal. The first performance was recorded for the Portuguese Institute in Rome. Karl Fiorini..s Violin Concerto, also written for Emanuel, will be premiered in Rotterdam in March 2008. Emanuel is an active chamber musician and has studied in masterclasses with Bernard Greenhouse (Beaux Arts), Florestan and Peabody trios and the Borodin, Takacs and Vellinger Quartets. He was a founder member of the Vianna da Motta Piano Trio, with whom he performed extensively in the U.K. and Portugal and recorded a CD for Centro Atlântico label. In 2003, he formed a violin and harp Duo with Ieuan Jones, playing regularly in the U.K. Since September 2005 Emanuel is the leader of Orquestra do Norte in Portugal. In June 2006 he played second solo violin in Gulbenkian Foundation’s project Uma Pequena Flauta Mágica (Lisbon). He plays on a tonal copy of a Guarnerius del Gesu, by Martin Schleske (Munich, 2004), which he acquired with the help of a Loan Fund for Musical Instruments’ grant.